What Is RSS, and How Can I Benefit From Using It? If you’re trying to keep up with news and content on multiple web sites, you’re faced with the never ending task of visiting those sites to check for new content. Read on to learn about RSS and how it can deliver the content right to your digital doorstep. In many ways, content on the internet is beautifully linked together and accessible, but despite the interconnectivity of it all we still frequently find ourselves visiting this site, then that site, then another site, all in an effort to check for updates and get the content we want. That’s not particular efficient and there’s a much better way to go about it. Imagine if you will a simple hypothetical situation. You’re a fan of a web comic, a few tech sites, an infrequently updated but excellent blog about an obscure music genre you’re a fan of, and you like to keep an eye on announcements from your favorite video game vendor. If you rely on manually visiting all those sites—and, let’s be honest, our hypothetical example has a scant half-dozen sites while the average person would have many, many, more—then you’re either going to be wasting a lot of time checking the sites every day for new content or you’re going to be missing out on content as you either forget to visit the sites or find the content after it’s not as useful or relevant to you. RSS can break you free from that cycle of either over-checking or under-finding content by delivering the content to you as it is published. Let’s take a look at what RSS is how it can help. What Is RSS and Where Did It Come From? RSS may be one of the most underutilized but incredibly useful tools around. One of the easiest ways to envision RSS is that is is like a living bookmark file. Normally you bookmark a site and you have to go look in your bookmarks to click on the site to get new content. RSS is like bookmarking in that you flag the site to be used in the future, but instead of sitting statically in your bookmark folder, your RSS “bookmark” is an active entity that is constantly updating itself with new content from the saved source. Historically, web sites mimicked analog mailing lists in order to deliver content. Material from the site gets packed up in a daily, weekly, or monthly digest, and fired off via email. For some content and perhaps for your particular reading style, email digests may be a perfect fit and they’re still in use by many web sites—if you’re interested in getting daily email updated from How-To Geek, for example, you can subscribe to the daily email here. If you want to get content as it is created and shared and in a format more flexible than an email digest, however, you’ll need RSS. In 1999 very early implementation of RSS came along and shook up how content was delivered to site subscribers. Originally called RDF Site Summary (later renamed to Rich Site Summary and then Real Simple Syndication), the first incarnation of RSS was the product of Netscape developers Dan Libby and Ramanathan V. Guha to serve as a content delivery system for the My.Netscape portal. RSS allows web sites to push out content in a standardized format commonly called a feed. This feed can be subscribed to by anyone with internet access and an appropriate tool called a feed reader. Accessing these RSS feeds is free and many popular and robust feed readers (which we’ll talk about more in a moment) are also free. To highlight the benefit of RSS, let’s look at the three ways you could interact with How-To Geek. You could visit the web site in a traditional manner. 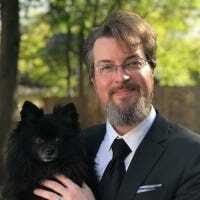 To get new content, videos, tutorials, and other material from How-To Geek, you open your browser and visit How-To Geek’s main page. That’s the way most people interact with most of the internet, by manually visiting web sites. You could automate the process by subscribing to our email digest. Once a day you’d get an email from us with some top stories and other content mixed in. Millions of people use email digests to get updates from web sites. It’s not a bad solution and one that many people are comfortable with, but it’s not immediate or flexible. Finally, you could subscribe to the main How-To Geek RSS feed or one of the sub-feeds and the content would be delivered automatically and instantly, along with the content from any other web sites you’ve subscribed to, in your feed reader. The last option really shines when you’re also subscribing to multiple other sites. Instead of having to check our web site or just getting a single daily email with our content, all the articles from HTG are delivered along with all the other content you’re interested in as one streamlined feed of news articles. Let’s take a look at how that plays out in the real world. There are so many powerful and excellent feed readers on the market that there’s no way for us to cover (or even summarize) all of them. 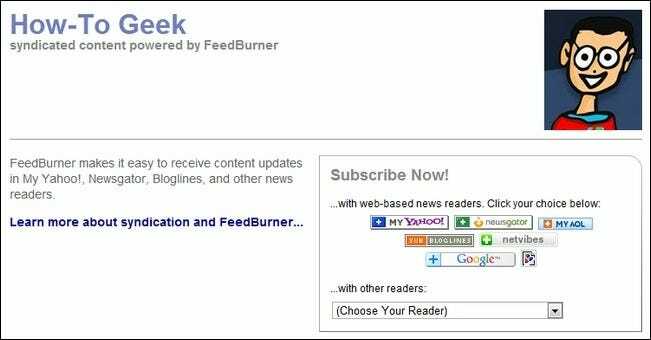 At the end of this guide we’ll highlight a variety of web-based and dedicated feed readers for you to check out, but for now we’re going to use Google Reader to highlight how to use RSS feeds. Google Reader is a solid choice for a variety of reasons: many people already have Google accounts, it’s free, and because it’s so widely used tons of applications integrate with and import from it. If you have no idea where to start then start with Google Reader; even if you outgrow it you can easily export your feeds from Reader to another application. If you already have a Google account, just type reader.google.com in your address bar to visit Google Reader (if you don’t, visit that link anyway and sign up for an account). Once you have a Google Reader account you’re ready to start adding content. Let’s put together a basic bundle of RSS feeds so we can see how easy it is to get content delivered right to our virtual doorstep. Since we’ll be using Google Reader, we’ll simply click the Google button in the Subscription box. When you’re prompted to add it to either your custom Google homepage or Google Reader, select reader. Now, a single subscription won’t do much to show off how great RSS is (even though we’re rather fond of the great content we put out here at HTG) so let’s add in some more content. You can visit websites you enjoy and look for the RSS logo or other RSS add-in buttons or check out some of the content we’re sharing here. We’ve only just started to populate our feed reader and we’ve already got automatically delivered and updated content from four great sources. The majority of feed readers, including Google Reader, allow you to easily sort and tag your feeds so as time goes on and your reader starts to bulge with new subscriptions you can easily sort and sub-divide them for those times when you’re in the mood to just read about cooking, DIY projects, or new research in your field of interest. Although Google Reader is a great and flexible fit for many users, there are quite a few robust feed readers to choose from. Here are a variety of readers you may wish to consider. Unless otherwise noted, the applications are free of charge to use. NetVibes (Webapp): Netvibes isn’t a dedicated RSS reader but more of a personal information portal. Despite the lack of RSS-only focus, it handles RSS feeds quite well and has a large user base. Reeder (iOS/Mac): While the versions range in price from $2.99 for the iPhone version to $9.99 for the desktop version, fans of the minimalist and easy to navigate feed reading application will tell you it’s worth every penny. NetNewsWire (iOS/Mac): Google Reader syncing, a snappy and polished interface, and a built-in browser for quick full-text reading of articles with their native layout, all work together to make NetNewsWire a popular option among iOS/Mac users. FeedDemon (Windows): FeedDemon is one of those powerful but kind of clunky looking apps. You’ll find features galore but don’t expect a polished the-future-is-now interface experience. Feedly (iOS/Android/Chrome/Firefox/Safari): Feedly is a slick little news reader that not only synches with Google Reader but generates new content and suggested feeds based on the content you’re reading. For more great RSS feed reader apps, make sure to check out our Ask the Readers: What’s Your Favorite RSS Reader? post to see what apps and tools your fellow readers are using. Have an RSS tip, trick, or app to share? Sound off in the comments below to share your knowledge.